Twenty-four-year-old Antonio Oliveira was born into a poor, mixed race family in the state of Maranhao in north-east Brazil. As a teenager he had to balance his time between school and helping his parents harvest vegetables to sell at a farmer's market, and doing other small jobs to scrape by. Until recently, he says the only prospects for those growing up in his city, Colinas, were to work with crops or to get a post at the city hall - "a mediocre job that people think is heaven," as he puts it. But Antonio has just finished his first term studying Economic Sciences at Rio de Janeiro's prestigious Federal University (UFRJ), a dream he had nurtured since his days at a rural public school. 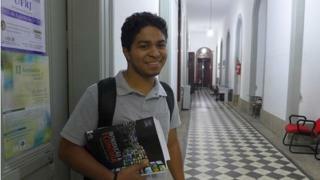 His placement represents a radical change in the Brazilian university system. A new law approved a year ago reserves 50% of spots in Brazil's federal universities for students coming from public schools, low-income families and who are of African or indigenous descent. The number of posts reserved for black, mixed race and indigenous students will vary according to the racial make-up of each Brazilian state. Ten years ago affirmative action gradually started being adopted in both state and federally funded Brazilian universities, in an attempt to give underprivileged Brazilians better chances of getting free higher education - and thus access to better jobs. Half of Brazil's population is of African descent, but the country's public universities tend to reflect the Brazilian upper classes - who are mostly white. Although these universities are free, those who traditionally made it in usually came from expensive private schools. Students from public education - the majority of whom are black or mixed race - were less likely to secure one of the highly competitive places. Now the "quotas" are mandatory in all of Brazil's 59 federal universities, which have until 2016 to reserve half of their positions for affirmative action. "I think this is a life-changing opportunity," says Antonio. "I hope I will get a good job after university and be able to give my parents more comfort as they grow old." But racial quotas have sparked widespread controversy in Brazil. Many who are against them argue that easing access to higher education denies the principle of merit that brings excellence to universities. "This is bad for the future of Brazil, because the main objective of universities is research, is to achieve quality," says Antonio Freitas, provost of the Getulio Vargas Foundation, a prestigious private university. "Eventually you may not have the most qualified people in engineering, in medical school, in the most challenging areas which Brazil needs to develop." Mr Freitas says Brazil is trying to solve a problem artificially. Instead of giving everyone good basic education, and thus conditions to compete as equals, the government is "trying to force students without preparation into university". Quota critics also argue that Brazil has never before had public policies based on race and that this establishes divisions in society. They say that promoting these policies would contradict Brazil's national identity, where most of the population is mixed race. Before the Quotas Law was introduced for federal universities, the State University of Rio de Janeiro (UERJ) was a pioneer of affirmative action. After 10 years, rector Ricardo Vieiralves says their experience challenges critics' arguments and says the quotas programme has been successful. He says there are fewer dropouts among students admitted through quotas, and they are the ones who graduate the fastest. "They have lower grades in the beginning but are level with the others by the middle of the course and sometimes excel non-quota students in the end." Mr Vieiralves says Brazil was unprepared for the abolition of slavery, which came to an end 125 years ago but its legacy has impacted generations of Brazilians of African descent and left deep racial inequality within the country's society. "Brazilian studies always showed that poor and black people did not make it into higher education. University was a place for the elites. "Quota students have a new opportunity, and they grasp it and study like crazy," says Mr Vieiralves. In Brazil, poverty and a darker skin colour often coincide. On average, black or mixed race people earn little over half of what white Brazilians do. Those of African descent spend on average two fewer years at school than the country's white population. With less education, many African-Brazilians only manage to get basic jobs. Joao Feres Jr, a political scientist at the State University of Rio de Janeiro, says it is "undeniable" that there is still racial discrimination in Brazil. He believes quotas are necessary not only to level inequalities but also to challenge expectations. "You grow up in a society where you never see a black person in a position of power or high status, so you learn to associate black people [with] menial jobs, [with] low paid-jobs. "Even people who are not actively prejudiced build up this kind of expectation," he says. "I think the affirmative action breaks with that." But even as the university system tries to level the playing field, the Brazilian job market still largely reflects the white elite. Less than 30% of Brazil's employers are black or mixed race. But some companies are trying to change the make-up of their workforce. IBM is one of them. Logistics procurement manager Warley Costa is in charge of a human resources group that aims to increase racial diversity at the company in Brazil. But when the company announces job opportunities, only a small number of Afro-descendents come forward as candidates, he says. "We see a gap on the university level. There is a small number of black people being prepared to go into university and to fill market positions that are open." The company liaises with universities, high schools and institutions linked to Brazilian black communities to attract and better prepare candidates. "We are trying to support them in order to give them better conditions to fill the job opportunities we have open," says Mr Costa. He says the number of black or mixed race employees has been growing by about 3% a year in IBM Brazil, which employs close to 20,000 people. "Today I can say that we are ok reflecting the Brazilian population inside our team. We have a big diversity here. We don't have gaps. But we are trying to grow, as much as possible." You can hear more on this story on Business Daily on BBC World Service on Friday at 08:30 BST (07:30 GMT) and 15:00 BST (14:00 GMT).